Back in the day when comics weren’t the big business they are today you only had a few underpaid and overworked people pushing out a large number of comic books every month. And those overworked employees and freelancers did an incredible job of laying the groundwork for the high quality of comic books we have today. But, because of deadlines (they actually met) and not enough eyes to look at every comic, mistakes were going to be made and you have some wonderful bloopers. And while DC comics has their share, I’m more of a Marvel fan and have focused on their bloopers. Read the top ten Marvel comic book bloopers and have a laugh. 10. Hercules pulls Manhattan Island? Really? Really? Marvel Team-up #28 – What’s the story? Okay, I’m not a picker of nits and I realize comic books aren’t the place to find factual stories that are based on truth. I also know a man can fly, breathe water, survive in space, shoot beams from his eyes and a hundred other powers which are described in the comic books, but the idea of pulling Manhattan is so absurd it must start the list of comic book bloopers by Marvel. And just what is the chain connected to on the island? The only “bigger” blatant disregard of physics I’ve found in comics is the defiance of gravity so many females are capable of with their bosoms. 9. Hank McCoy (Beast) insults the female gender. Jean Grey telekinetically “hands” Hank a screwdriver but then calls it a pair of pliers. Hank decrees she is a “credit to her gender”. I guess Hank knew he didn’t have a shot at dating Marvel Girl, so an innocent jab at her and the entire female gender seems to have been in order. 8. Conan apparently doesn’t like waiting a waitress. I guess the writer, Roy Thomas, was mighty hungry when writing for this issue of Savage Sword of Conan. Or else the letterer was working at the local coffee shop. Either way, the “little hussy Murelia” better bring him his blue plate special fast after he calls her a waitress (see green text). 7. The Grim Reaper, give him a hand. No wait, he has an extra already. Luckily the grim reaper was able pull down his mask with his prosthetic hand before quickly replacing it with his metal scythe. Who knew he had so many attachments. Thankfully this has prevented any bathroom accidents. 6. Two left hands, no wonder he is so fantastic. Fantastic Four #88 – What’s the story? I guess Reed Richards, Mr. Fantastic, isn’t satisfied with just scaring the crap out of Alicia Masters by tapping her on the head, he reinforces the shock by using a second left hand? Keep the baby away, Alicia! 5. Stop it, Mr Fantastic, you’re scaring the children! 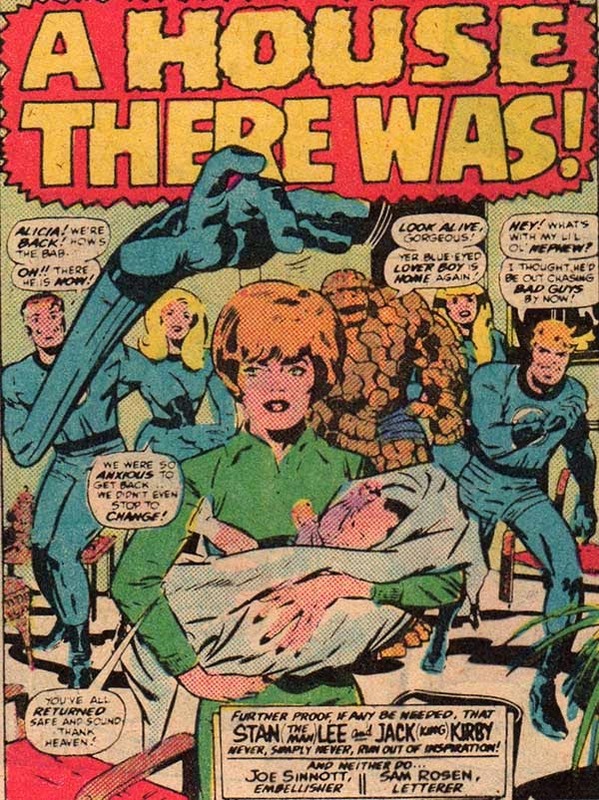 Fantastic Four #152 – What’s the story? Apparently Mr. Fantastic is always the joker. After permanently scarring his child and Alicia Masters (see above) he now decides it would be funny to have two right hands…and a left hand. Check out the hand that should be a left foot, high up in the window. I have zoomed in for a closeup in the bottom left of the picture. Not only was a hand drawn in place of the foot, but a right hand was used for a left foot! The atrocities continue. 4. I can’t see a thing with this damn eye patch. Captain Barracuda is obviously seeking attention for his disability or else he was too embarrassed to admit his mistake. Trying to look through the periscope with the eye covered by his patch is probably a desperate cry for help. 3. Peter Palmer? Peter Who? 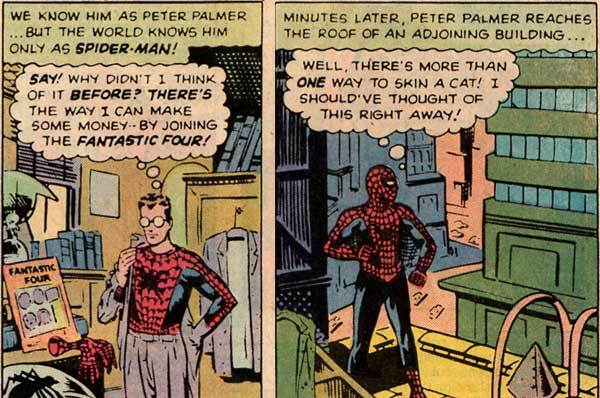 Does Stan Lee really call Peter Parker, Peter Palmer? Yep, he sure does and thank the Marvel gods he got it right later. Cut Stan some slack it was only the second issue Peter had appeared in. But, can you imagine trying to root for a guy named Peter Palmer? Maybe we got the wrong guy after all. I mean with all the clone stories, maybe there really is a Peter Palmer out there biding his time. Captain America admits defeat before the fight even starts. Our only guess at his lack of confidence was some kind of attempt at reverse psychology. I guess that is why he is a fighter and not a thinker. 1. The Amazing Super-Man…I mean, Spider-Man…I mean…what? Okay, wow! Could there have been a bigger blunder than for Doc Ock to call Spider-Man, Super-man? I mean, where were the army of DC lawyers to sue Marvel and shut down Amazing Spider-Man? They could have prevented the atrocious Clone stories and the even more despicable “One More Day” storyline from Spider-Man. Of course, we would have also lost a host of great Spider-Man stories as well. Maybe those over-sized glasses are covering a severe vision problem and he only saw the red and blue colors and made an honest mistake. Do you disagree with this list of Marvel comic book bloopers? Make a comment below or send us your own list. Got a list of DC comic bloopers? We’d love to see it. These were sourced from Marvel’s No-Prize Book. Thanks for mentioning this great blooper. On Amazing Spider-Man #98 Spider-Man is missing the Spider logo on his back. Tut tut Gil Kane. If you notice, Captain America’s punching hand is completely wrong. His right arm is holding the shield…and he’s punching with his left…but it’s drawn as his right. Perhaps that’s just Reed Richards again, disguised as Captain America? Excuse me, I meant his left hand is holding the shield and he’s punching with his right…which is drawn to be his left. Uhm, the Reed Richards two right hands is incorrect, the foot became a left hand… Note the curve. Idiocy. Wonder why they changed it from Peter Palmer to Peter Parker? Probably the name was too sexual…..
“Laying the groundwork?” Did you just say classic comics only “laid the groundwork” for today’s super-excellent comics? I’ve got news for you, a lot of comics fans think the stuff that gets published today is just an embarrassing parody of the fantastic stories of the eras that came before. I can’t believe any long-time reader would so carelessly dismiss the work of these legendary creators as nothing but a foundation for something superior. Comics today are no less rife with errors, but they sure are a lot less fun. This list is garbage. Half the things on here aren’t even bloopers, they’re just things you think are stupid. Pulling islands around is what Hercules does. Beast acting like he’s from the 1960s in a story from the 1960s? Blooper! Out of context panel from Conan that doesn’t have any sort of error in it? Blooper! Also, Mister Fantastic can twist his body into whatever shapes he wants. If he wants his right hand to be his left hand, he can do it. I’ll allow that those probably were actual errors, but since so much of the rest of your list was garbage, I’ll mention that, too. There are plenty of examples of actual bloopers you could have used, but you didn’t bother to look outside the silver age because you look down on it and think it’s lesser quality. It’s fine to not know about comics, it’s a niche hobby, but don’t then write lists like this and act like you know what you’re talking about. Yo Mama, this bloopers came from Stan Lee himself who labeled them as bloopers. Complain to him. Don’t attack the writer, me. Please submit one blooper since you know of so many. And I have been reading comics since the early 80s, I do know comics. You though, seem to be lacking since you haven’t heard of The No-Prize comic which listed all of these bloopers and more. Stan ‘The Man’ Lee admitted they were bloopers. I will take his word over yours. In hindsight, the strangest mistake Marvel every acknowledged was about two construction workers. It seems a coloring mistake was made so it looked like two white guys were talking like African-Americans. Obviously, this was years before Vanilla Ice…. Hercules pulled Manhattan in backwards. The south side of the island goes the other way towards the water. Although it is found in replies to comments, in the interests of full disclosure you really should give proper attribution to the original source of all of these. I wrote this list before that Wiki page was created. But thanks for adding it now. I appreciate the humor with the Hercules thing, but I don’t believe it was an actual blooper, knowing them Greeks myths, Hercules could have very well placed a “chain” around himself, and a piece of land, and “pulled” it back in place. Greek Gods aren’t exactly people, or even tangible beings, but when told in stories they take on human form, Hercules became a full god when he had received the name “Hercules” so he’s allowed the same mysticism. So I can imagine that scene as the magical demi-god magically brought back Manhattan, somehow, and for our human brains to comprehend, it would appear as if he wrapped a chain about himself. Of course, I’m just making up stuff here, and by all physics and logic, that picture makes absolute no sense, I’ll agree with you on that. The “blooper” with Beast and Jean, however, is not actually a blooper, nor is it the offense you’re trying to give it. One, with Jean calling a screwdriver a “pliers”, it’s obvious that she has no idea what she’s talking about, meaning when he said she was a “credit” he said it sarcastically, meaning that if he wasn’t being satirical and witty, he would have seriously said “You’re an insult to the female gender”, but that comes out a bit more harsh, and less joky when speaking to a friend; that means he insulted Jean, not the female gender, in fact, he’s praising the female gender, because he could have very well said “just like a woman”, with the common misconception that women don’t know squat about tools. Now, you’re blunder should be on why the most intelligent, all knowing, telekinetic woman in the whole entire universe would not know what a screwdriver is, yet harbor the word like “pliers” in her vocabulary to begin with, and not be able to remember what pliers look like. Also, with Beast reaching for the screwdriver she’s offering, I’m sure that is the tool he wanted, and for him to before hand tell her “hand me the screwdriver”, and she picks it up, but calls it “pliers”, means she’s even stupider than the ditzy, never handled tools, woman this script writer was trying to portray her as. How does a mentally advance psychic mutant with the future to be an all knowing being when the mind and thoughts are concern not remember Beast said “screw driver”? These script writers were obviously trying to make a crack at women, and they chose the wrong one to do it with, making this sexist scene more outrageous than it had to be if it was done by a different female. In case you didn’t get it in my rant, what I’m saying is the bloopers is the writers were being sexist by making Jean say “pliers” not Beast in his teasing comment that insult _just_ Jean, and not women. Even if he said “You’re a credit to your race”, he’s not insulting humans, he’s not insulting mutants, he’s not insulting white people, he’s insulting Jean, full sail. I can only relay what I saw written by Stan Lee. He said the Jean dialog was a blooper. Marvel Comics published an issue of (some of) these and other mistakes back in the 80s. I remember they included a panel from an early Amazing Spider-Man where his eye-spaces had pupils. I cannot for the life of me remember what the issue was called. Ah, TopTenz beat me to it! The Marvel No-Prize Book! Agreed, pulling an island with chains is ridiculous. But it seems to me the real Hercules blooper is suggesting that one of his 12 labours was what was instead Atlas’s punishment.